The Simple SEO plugin is quick and easy tool for building a solid foundation for an SEO-friendly website. 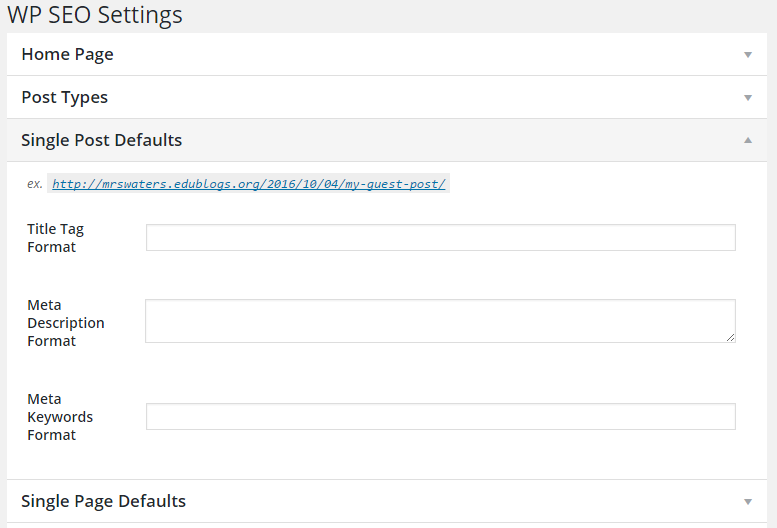 Once you have activated the Simple SEO plugin in Plugins > All, go to Settings > SEO to configure. The SEO settings page located at Settings > SEO has headings for each group of fields you can customize. By default, groups are hidden and clicking on the heading expands it so you can customize the default format of <title> tags, <meta> descriptions, and <meta> keywords. Once you’ve completed editing fields you click Save Changes at the bottom of the page. The power of formats, though, is in formatting tags, which create dynamic text that responds to the content of the page. A formatting tag looks like #site_name# or #author# or #archive_date#. If you had a custom “Review” post type and wanted the <title> tag to include the date each review was last updated, you could go to “Single Review Defaults” and, under “Title Tag Format,” use “#title# Review (Updated #date_modified#). #site_name# – Replaced with this site’s name. #site_description# – Replaced with this site’s description. #title# – Replaced with the title of the content being viewed. #excerpt# – Replaced with the excerpt of the content being viewed. An excerpt is generated if one isn’t written. #date_published# – Replaced with the date that the content being viewed was published. #date_modified# – Replaced with the date that the content being viewed was last modified. #author# – Replaced with the author name of the content or author archive being viewed. #categories# – Replaced with the Categories, comma-separated, of the content being viewed. #tags# – Replaced with the Tags, comma-separated, of the content being viewed. #term_name# – Replaced with the name of the term whose archive is being viewed. #term_description# – Replaced with the description of the term whose archive is being viewed. #post_type_singular_name# – Replaced with the singular form of the name of the post type being viewed. #post_type_plural_name# – Replaced with the plural form of the name of the post type being viewed. #archive_date# – Replaced with the date of the archive being viewed. #search_term# – Replaced with the user’s search term. The SEO settings page located at Settings > SEO allows you to set the global defaults. Simple SEO also allows you to set custom title, description and keyword values for individual posts, pages and taxonomy terms. 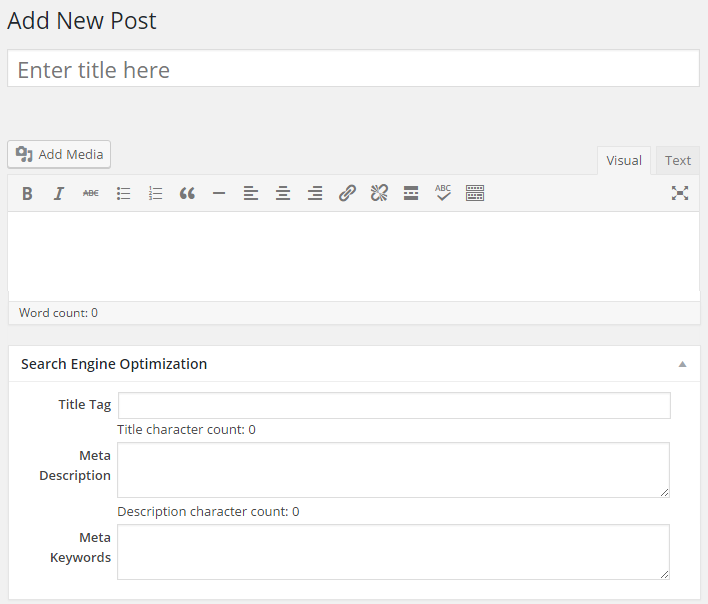 The <title> tags, <meta> descriptions, and <meta> keywords are added to the Search Engine Optimization module located below the post/page editor. Custom <meta> tags that are used throughout your site can be added under Other Meta Tags in Settings > SEO. For example, if you wanted to add a Google Verificationtag for your site, you could go to “Other Meta Tags,” add “google-site-verification” under the “Name” field, and the value under the “Content” field.